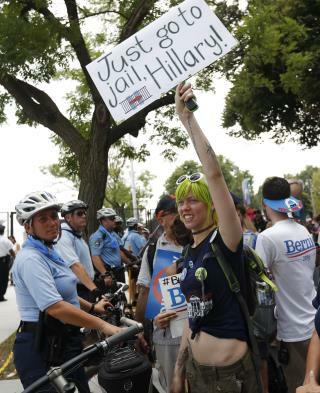 (Newser) – Police took 40 people into custody outside the Democratic convention Monday evening after several hundred Bernie Sanders supporters and other demonstrators converged in the sweltering heat, chanting "Nominate Sanders or lose in November!" and "Hey, hey, ho, ho, the DNC has got to go!" The marchers set out from City Hall and made their way some 4 miles down Broad Street, gathering near the Wells Fargo Center around the time the convention was gaveled to order, the AP reports. Protesters tried to climb over police barricades at the edge of the security zone surrounding the convention, and police Chief Inspector Joseph Sullivan said 40 people were taken into custody. As tensions mounted, police moved metal fences into place and closed the nearest subway station to arriving trains. Even democraps don't like HideBeast. Look right wingers .....protestors .....go crazy and say its mayhem.